Kevin Flynn (Jeff Bridges), prolific software designer and ENCOM international CEO, has been missing for twenty years. His disappearance has adversely affected both the company and the life of his young son Sam (Garrett Hedlund). Since his disappearance, ENCOM international has gone from a company set on changing the world for the better to a corporate behemoth that rules it from on high. Kevin’s friend Alan Bradley (Bruce Boxleitner), now an executive consultant, tries in vane to maintain Kevin’s vision. He advices Sam to take his rightful place at ENCOM, but the rebellious youth finds acts of sabotage against the company much more diverting. When Sam goes to his father’s long defunct video arcade to investigate a mysterious page at Alan’s request, he suddenly finds himself on the game grid that his father described to him as a young boy. There, he engages programs in gladiatorial combat, and finally reunites with his dad. Together with the mysterious Quorra (Olivia Wilde), they hope to defeat the tyrannical Clu 2 and get back to the real world. 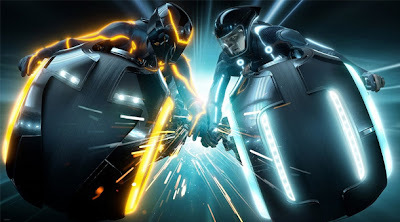 Tron: Legacy is the sequel to 1982’s Tron, a box office disappointment that has since garnered a huge cult following and influenced countless special effects technicians. The visual aesthetic is both very familiar and markedly different from the original. In the original Tron, the real world and the game grid were distinctly different. Game warriors wore tights outlined in neon. The edges and counters of the ships and vehicles they used were likewise outlined. Any visible flesh appeared in grayish hues, as though a flickering black and white image being projected onto a screen. In Tron: Legacy, video warriors are still outlined in glowing neon strips but the color palette is infinitely larger. The lighting, color and texture of the exposed flesh looks real, as do the material on the suits themselves aside from the aforementioned neon lights. As a result, the actors look like actors in costumes superimposed into a highly detailed computer world as opposed to products of that computer world. The ethereal quality of the original is gone. That is not to say that the visuals are bad or betray the designs of the original. 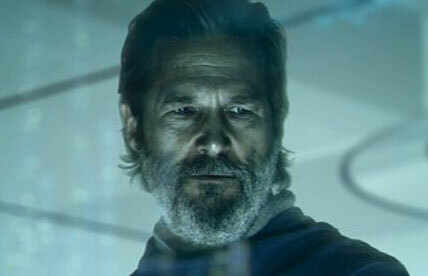 The game grid of Tron: Legacy is an evolved version of its predecessor. The light cycles are sleeker, and the jet walls they leave behind are translucent. When a game warrior is “derezzed,” he doesn’t simply dissipate into ripples of light. Now, he shatters like crystal or splashes against jet walls like a wave of neon paint crashing against a shoreline. The effect is stunning even when taken out of the larger context of the film. The sound design is equally enthralling. The light cycles roar to life, and the reverberations cause ripples in the audiences clothing. These factors cause the action sequences to have a life of their own despite the fact that they are not always that well choreographed or filmed. Daft Punk’s score pulsates with infectious energy. If there is one thing that Tron: Legacy excels at, it’s sensory input. Unfortunately, just as Sam Flynn has inherited his fathers technical prowess and disdain for authority, so too has Tron: Legacy inherited its predecessors flawed storytelling. Audiences in 1982 found the original hard to comprehend as the world was largely computer illiterate back then. There was no entry point for the layman. In retrospect, the storytelling in Tron was smooth if a bit anemic at points. The religious/spiritual metaphors ring out loud and clear. By comparison, the story of Tron: Legacy is as incoherent as people (wrongly) perceived the original to be. It is also a bit too derivative for its own good. Aside from a few details, the plot is nearly identical to the original. There are many interesting but unexplored concepts. The expository dialogue introduces ideas but does not explain them in a plausible or coherent way. The principle actors seem as though they have been coached to emote in the most obvious ways possible. Garrett Hedlund is not as engaging as Jeff Bridges was in the original. Bridges seemed like a daring, if somewhat spaced out wunderkind. He was awed and disoriented by the game grid but he caught on fast. He reacted to his environment instinctively. By comparison, Sam seems clueless. He bungles from one game to the next, seeming to float by on sheer luck. He never develops into the kind of character that audiences have faith in. Things happen to him, but he never ever seems in control. Thankfully, Jeff Bridges reprises his role. He is weathered and gray, but still the same technically adept hippie from the original. Bridges knows this character, and the movie comes to life whenever he is onscreen. 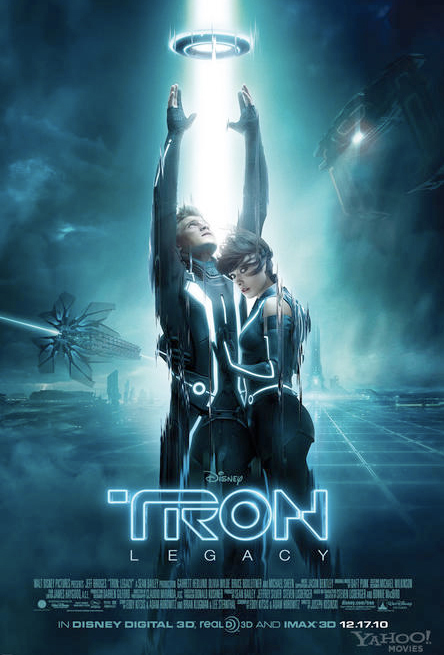 Tron: Legacy succeeds on the technical front. It draws you into its world and elicits involuntary sensory submission through its forceful sound and light show. Its merits are muddled by a story that is surprisingly less engrossing and understandable than the original despite being modeled after it. As in the original, Jeff Bridges is easily the most engaging personality in the piece. Unlike the original, the viewer is not allowed to live vicariously through him and experience the grid through his eyes. Instead, they are saddled to a somewhat inconsequential protagonist. Intriguing prospects and questions about the act of creation are left frustratingly unexamined. The imagination with which Tron Legacy is visualized is a joy to behold, and makes it worth the price of admission. Too bad the screenwriters didn’t figure out a more clear and compelling way to communicate their ideas. this is my first movie at IMAx 3D. Doesn't have much story in it though.